Global Arts Performance Initiatives, an engagement program of Krannert Center for the Performing Arts in partnership with the Student Sustainability Committee at the University of Illinois, Krannert Art Museum, Spurlock Museum, Unit One at Allen Hall, and the Urbana Park District, is excited to announce the schedule of programming for the Sonified Sustainability Festival April 20-28, 2017. Festivities kick off April 20 at 7:30pm with New York City-based instrument builder and jazz musician Cooper-Moore performing a Sudden Sound Concert at Krannert Art Museum. Sonified Sustainability Festival continues with an Earth Day Celebration, Saturday, April 22 from 2pm-5pm at Krannert Center for the Performing Arts. The celebration will feature New York City-based artists Terry Dame, who performs innovative electric music on homemade instruments made from recycled materials; Bradford Reed and his amazing pencilina, an electric board zither played by striking, bowing, and plucking the strings; and Geoff Gersh, who pushes the sonic capabilities of electric guitar with and without the aid of electric devices and found objects. Along with the featured artists, there will be special guests from the community, environmentally themed craft activities, and an information fair on sustainable organizations. On Sunday, April 23, Reel Orchestrette, featuring Reed and Gersh, will provide live music accompaniment to the 1924 silent film The Epic of Everest directed by J. B. L. Noel at Spurlock Museum. On Tuesday, April 25, Sonified Sustainability Festival acknowledges the 35th anniversary of the seminal environmental film Koyaanisqatsi—directed by Godfrey Reggio and featuring music by Phillip Glass—with a screening of the film at Spurlock Museum. The festival concludes on April 27 and 28 with soundwalks in Urbana parks led by Chicago-based audio artist Eric Leonardson, co-chair of Midwest Society for Acoustic Ecology, an organization dedicated to exploring the role of sound in natural habitats and human societies and promoting public dialogue concerning the identification, preservation, and restoration of natural and cultural sound environments. 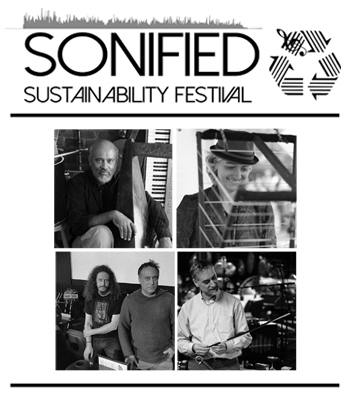 Sonified Sustainability events are open to the public, free admission, and suitable for all ages. Check out the full list of programs.